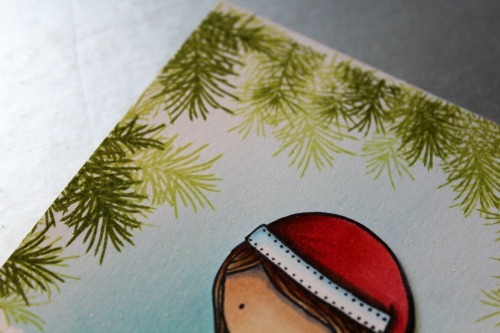 I am still making Christmas cards, guess i should have started sooner. I'm not normally one to mix stamp companies not sure why i just don't but for today's card i wanted to use the little santa girl from neat and tangled but she need some thing extra for a background. I stamped the girl in momento black ink and coloured with copics. I then fussy cut her out. I made the background directly on to my card base using distress inks with some torn paper and the image from winter woodland. It makes a simple but effective background and adds some extra detail.